A bright and well-laid out classroom environment can really make a difference when it comes to helping Reception aged children used to free flowing activities, settle into the first term of Year 1 when more structured work will be required. This was certainly evident during Everything Dinosaur’s visit to the two classes of Year 1 pupils at The Oaks Primary School. The classrooms were bright, spacious and a lot of care and attention had been given to helping to create inspiring wall displays to enthuse the children as they learned all about dinosaurs and life in the past. Lots of dinosaur and prehistoric animal information on hand to help inspire the children. During the visit from one of our dinosaur experts the children demonstrated lots of knowledge, confidently naming and describing a number of dinosaurs. One of the children’s mums also commented that her little boy had been so excited to get to school to learn all about T. rex that he insisted on reading his dinosaur book in the car! One of the resources the teaching team were using was the set of ten fossil models, appropriately supplied by Everything Dinosaur. These sturdy, plastic models are replicas of famous fossils and they are great for use in craft activities. The set contains replica dinosaur skin, a dinosaur tooth model, an ammonite, trilobites, even a fossil frog! They are really useful for helping to explain about different types of fossil and which parts of animals are likely to become preserved. Great for making casts of fossils. The enthusiastic teaching team discussed their scheme of work and they certainly have lots of hands-on activities planned for their young palaeontologists. 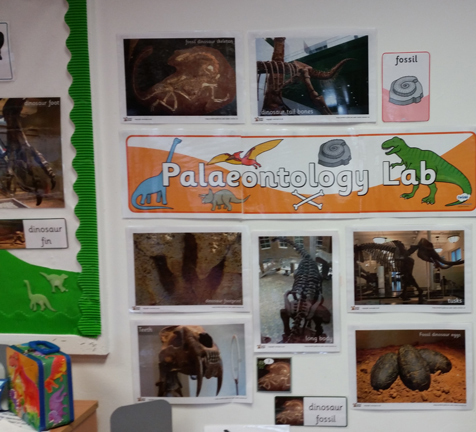 Class 1H even had a palaeontology laboratory in part of their classroom. Preparing fossils can take a long time. How long depends on the particular fossils involved, but if one of the Year 1 children was to uncover a complete Tyrannosaurus rex skeleton on their sixth birthday and work on it five days a week in the preparation laboratory, they might have finished cleaning, preparing and mounting the skeleton by the time they got to their early thirties! Inspiring the next generation of palaeontologists. To help bring the term topic to an exciting conclusion, the teachers, with the aid of the dedicated teaching assistants, intend to devote a small portion of each of the classrooms to a “dinosaur museum”. They plan to present samples of the children’s work in these museums and parents, guardians and other grown-ups will be invited along to have a look at the children’s discoveries and to see examples of creative writing and how the children have gained confidence with their numeracy. The classes certainly enjoyed their dinosaur workshops and they loved learning about (and handling) fossils. Once back in the office, our dinosaur expert emailed over some more prehistoric animal themed resources to help support the school’s scheme of work, we even sent over a picture of the formidable and ferocious Tarascosaurus, for Tara, one of the teachers. This seemed only fair as we had provided Lily and Tyler with pictures of Liliensternus and Tylosaurus respectively, all to help inspire the children to design their own dinosaur.